We had a blast from the past in our latest game night. Petri demonstrated the semi-skirmish Napolenic ruleset Chef de Bataillon, published in 1995. We pitted one Austrian battalion (144 figures) against two French battalions (72 figs each). The rules are trying to simulate the role of the battalion commander. Which they do fairly well in my personal opinion. Unfortunately this means that the player has very little to do, apart from trying to roll the dice well enough to get his unit to do what he wants. Even shooting is not automatic, you have to get your unit to follow the order to “fire”. Very strange. Personally I think the rules are an interesting anomaly as I prefer grand tactical games, where troops actually set up far from each other, the player can decide where and how to attack and defend, and actually feel that he is fighting the opponent, not the game system. Not that exciting, but interesting as an exercise. I have just had a short game or two of these rules with a couple of friends today. We have decided that the ground scale is far too large for the tables we have, and so have modified the game to 1cm = 100 yards. We played 3 French battalions against 2 Austrian ones. As there was now lots of space to manoeuvre, the French sent one battalion marching round the flank of the larger of the two Austrian battalions and managed to attack into the flank of this battalion. 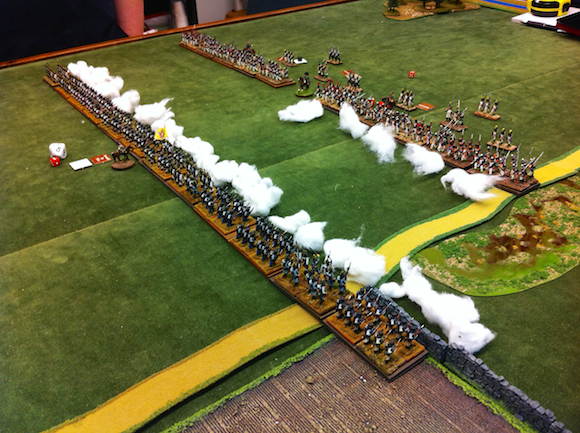 Meanwhile, on the other flank, an Austrian column attempted to attack the French in line and were luckily repulsed. Once the Austrian centre gave way the game was over. The game lasted about 20 turns and was completed in about 2 hours. It was great fun and I think the system is well worth investing time and energy into. Do not assume you simply need to line-um-up and shoot-em-down, the rules are far more complicated than that.